Garden Pond Cleaning – A Beginner’s Guide to Cleaning a Garden Pond. If you want a garden that looks amazing, the enhancement that can change everything in it is a clean garden pond. In case you don’t have a garden pond, you should seriously consider making one, because it can really change the décor of your recreational space a great deal, plus it will pay you back in more than a number of ways. Please note*** a garden pond doesn’t have to be too big, since even a small patio pond is enough for adding a goldfish, few water plants and even a small pump to create that lovely sound of babbling water everybody loves. But, if you already have a garden pond, keeping it clean is a must and this is the right place for you. The cleanliness of your garden pond will not only have a better visual impact, but if it is not done with regularity, it can give you a lot of headaches when you actually come around to the maintenance of the pond, it’s like if you did not do any cleaning in your home it would soon become a problem. Just think you would need to get a skip in and clean the house out, this is the same as our garden pond cleaning service. So if you are looking for garden pond maintenance information or garden pond cleaning tips you will find the following guide to garden pond cleaning more than useful. The reasons you need to clean a garden pond? Your pond, regardless how big or small, is a tiny ecosystem. This means that various processes will be taking place under the water surface of your garden pond, which will change its appearance and composition in time. For instance, if you have fish in the garden pond, they will make it dirty through excretion processes. This debris can increase levels of ammonia and other chemicals that can become toxic for the fish in time, in case the pond is not cleaned. Also, fish consume the oxygen in the water, so besides cleaning you will also need to aerate the pond. It is true that if you have plants, they will release some oxygen into the water, but they will still need your help for restoring the balance into the garden pond. But, even without fish, the garden pond still needs periodic cleaning because things are happening in it all the time. The most common problem in the case of garden ponds is green algae accumulation. This type of algae is the one that makes the water in the pond look green like pea soup. If it spreads too much, it can lead to the suffocation of the garden pond, because this algae also consumes the oxygen within the pond. Besides algae, you will be surprised to see that aquatic weeds can also take over your garden pond, ruining its beautiful look. So, as you can see there are many things that can ruin the way your garden pond looks, plus endanger the lives of the flora and fauna you have in it. Still, you shouldn’t worry about these aspects, because you are not the only garden pond owner that has to face them. These are processes that are taking place in every body of water naturally, they can be kept under control in your garden however through regular cleaning and maintenance of your pond. How to keep your garden pond looking good! Even if the idea of dealing with disgusting green water seems almost impossible to manage, it is not mission impossible. If you know a couple of things of how to keep the water in the garden pond clear between maintenance operations, having a pond in your garden and taking care of it will stop being so dreadful. You will be surprised to see that there are some easy and natural ways for keeping your garden pond in a great shape. To start with, it is good to know that it is the plentiful sunlight that manages to make green algae flourish, so having plants that can shade the garden pond even if only partially, can help by diminishing the risk of these algae’s to show up too often. Of course, rain can also introduce nutrients into the garden pond’s water, again feeding the algae, but this is a different story. If you don’t have any trees or shrubs around the pond, growing some water lilies can help with the shade. But, do remember that it may be recommended to divide the lilies every three to five years or so, in case they start overwhelming the area and taking over the whole of the surface of the garden pond. How to keep pond water clear naturally! Natural ways to help clean your garden pond, they might not be the best for every pond but cheap and cheerful for large garden pond owners. How to clean a natural pond? Believe it or not, you can now buy barley straw extract for your garden ponds or even barley straw itself from a number of places (but be careful that the straw has not been sprayed with any nasty chemicals). The science behind how the barley straw extract actually works gives us as pond contractors a great reason to think about barley straw. It’s a great ally when it comes to keeping the pond water clean and the garden pond presentable. This is a completely natural solution for cleaning the garden pond water, which will not harm any of your plants or fish that may live in your back garden pond. And, it is very cheap as well so if you have a large pond then this is what I always recommend. Barley straw extract may even do a better job at cleaning the garden pond water than a lot of the shelve pond cleaning chemicals (please note I am not talking about every back garden pond only some ponds). But sometimes other fancy pond water cleaning solutions are just far to expensive on very large garden ponds, some of these pond cleaning treatments contain chemicals and are far more of a problem and long term are very expensive. So if you have a very large garden pond you have all the reasons in the world to try out this method of cleaning your pond. How the barley straws actually cleaning the pond? When these straws decompose, they release in the water a substance very similar to hydrogen peroxide. The substance suffocates the algae, not allowing them to develop anymore, leaving behind clean garden pond water. All you have to do is introduce the barley straws in the pond with the help of a mesh bag or net, so you won’t end up trying to clean the pond of straws. Wondering what maintenance is needed for a clean garden pond. So, you took care of the green water or single cell algae. How to clean a pond without draining it. Now that the water is clearer, strings of green algae may be visible along the borders of the pond, hanging on rocks and whatever materials you may have submerged in your garden pond. You will manage to grab these string algae remains out of your garden pond by using an ordinary and cheap toilet brush attached to the end of a garden cane. With the help of these simple tricks and materials, you won’t need to stick your entire hand in the pond to clean it properly. Of course, you will need a new toilet brush for this operation, borrowing the one you already have in your bathroom not being a good idea. As any garden pond will not like the extra strong cleaning products you use in the house. With the help of the brush’s bristles, you will catch the algae and reach even in those spots where cleaning may be a bit trickier. Also, with the same toilet brush, you can scrub the surface of everything in your garden pond and make sure everything is squeaky clean. (If you find it impossible to clear algae we supply a great product call Multi Clean which is a spot treatment for garden pond algae this will lift of the hardest Algae from pond rocks). If you have a water filter in your garden pond, you should know that the filter should be cleaned with regularity. During summer, when the weather is warm and there is plenty of sunshine, it is recommended to clean the mechanical filter daily on some models, or as often as possible. Please note*** On our ecosystem natural pond range pond maintenance is very easy and quick. Plus you don’t have to clean it daily, weekly or even monthly just a couple of times a year, depending on fish load. With the ecosystem natural pond package cleaning is a simple operation, because you just have to remove the basket from the pond skimmer and wash the media in the waterfall filter every now and then. Plus you can easily wash the mesh pad in the ecosystem garden pond waterfall filter, with tap water as the whole pond is active and alive with biological cleaning bacteria. This information might go against the grain with some pond owners. But stay with me I will explain. Most garden ponds in the U.K. still have bare pond liners and yes it might be easier to keep clean. But the surface area of the bare liner is just like a patio, yes it’s easy to clean but leaves will just sit on it waiting for the wind to blow then somewhere else. Rocks and gravel in an Eco System pond not only protect the bare liner but it’s active just like the forest floor. Where the micro organisms with process the waste digesting and eating it. So the mesh pad in a waterfall filter on an eco system pond is in fact only a very small part of the biological filter stage. On all other types of garden ponds the filter system will be the home of most of the beneficial bacteria so only use garden pond water or rain water to rinse the media well, removing all the debris and sludge might take time with some systems but it’s much better in the long run. Please note*** Tap water must not be used as it may kill all the beneficial bacteria back to so it is in fact sterile, then your garden pond filter will take 4-6 weeks to mature again. This is a very common past time with UK pond owners and a very big problem, but most garden pond owners do not know this but now you do so it’s not recommended. Please pass*** this information on to a friend or family member as they might be doing more harm than good cleaning their filters with tap water, weekly or even on some garden ponds daily. Before you start if you are unsure what system you have we would recommend you read the instructions and recommendations of your pond filter’s manufacturer, to make sure that you are doing everything right. If you see any leaves, sticks, seeds, and other vegetable matter floating on your pond, it is best to remove it as soon as you see it. In case you leave it in the water, this vegetable matter will start decomposing, providing the right type of food algae need to start multiplying very quickly. A net with a long handle is more than perfect for this kind of operation. People that love doing DIY should also invest in a pond vacuum, so it’s possible to clean the bottom of the bare garden pond as well. These are devices that are not that expensive and can be found in many of the UKs aquatic stores. When you vacuum the pond’s bottom, it is recommended to get out approximately 10% to 15% of the water in the pond and replace it with new and clean treated tap water. You can do this daily but be carful your fish will start to grow faster than you can imagine. But beware of doing large water changes in one day as this can be very harmful, but very easily done with garden pond vacuum cleaners, as once you start you don’t want to stop. If you have fish in the pond, do your best to feed then with high-quality food and in the correct amounts. Too much food for the fish will end up decomposing in the pond, creating a favourable environment for more algae. When is the best time to clean a garden pond? On an ecosystem garden pond the spring is the best season to start cleaning your pond. As you will not have many leaves in the pond after removing them out of the pond skimmer basket in the autumn. But after an entire cold season when the weather is warm enough you can start refreshing the look of the ecosystem garden pond. In the early spring, the fish are starting to be quite active and the plants in and around the pond are starting to think about growing and are not that large, so they are easier to handle. So, start the garden pond cleaning operating when the plants are still relatively small and don’t postpone it for warmer days when they have now grown too large, because this will only make things harder. All other garden ponds that do not have large surface skimmers. It’s now a different story as Spring and Autumn (Oct – March) is a great time for pond cleaning. Every pond is different, the surrounding and the type of garden pond can change the amount of work needed to keep the water clean and healthy. The fact that during autumn the leaves can be falling for long periods, it’s best to clean the garden pond right after this has finished or as the leafs fall. In ideal world these types of garden ponds should be netted to stop the leaves even hitting the water surface. If you leave the pond open to the elements and leave the cleaning until the spring the pond’s bottom may have accumulated lots of fallen leaves as the wind will have blown them into the garden pond during the winter. If they are not cleaned out before the frogs start spawning then it’s a much harder job to clean around the spawn, as the leaves start decomposing into the pond water as it warms up in the spring. This debris can cause a lot of trouble for your garden pond if left unchecked. 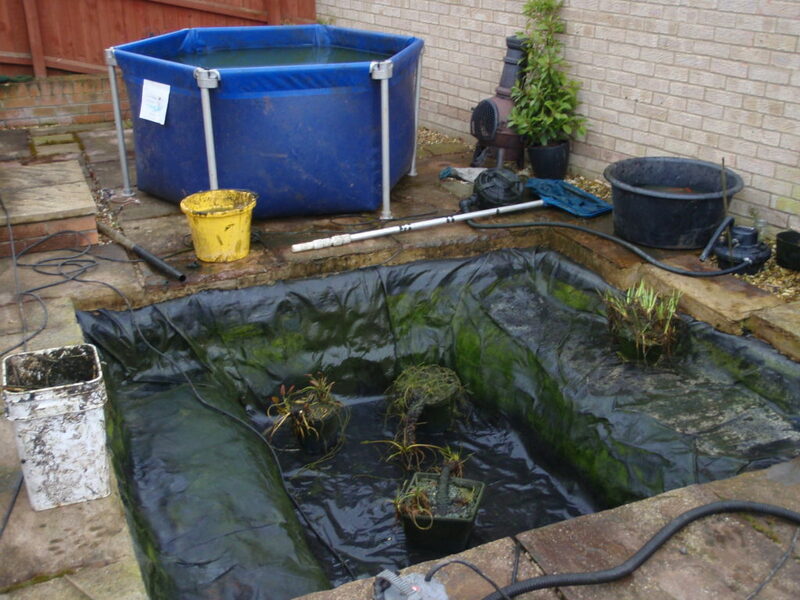 Before starting a complete pond cleaning on a really dirty garden pond, do know that it is best to remove the fish as quickly as possible, before the operation clear up starts, because debris can get caught in their gills. Put the fish in as bigger container as possible that has filtered water from the garden pond, so that they do not have any extra stress from being moved around, plus if you keep them in different water the change might be too sudden for the fish to cope with, then you will have bigger problems than a dirty garden pond. Once the general cleanup or the full drain and clean is done, all you have to do is to perform regular maintenance operations to keep the garden pond clean and beautiful throughout the entire warm season. Hopefully you have learnt something and you can now start caring for that garden pond.